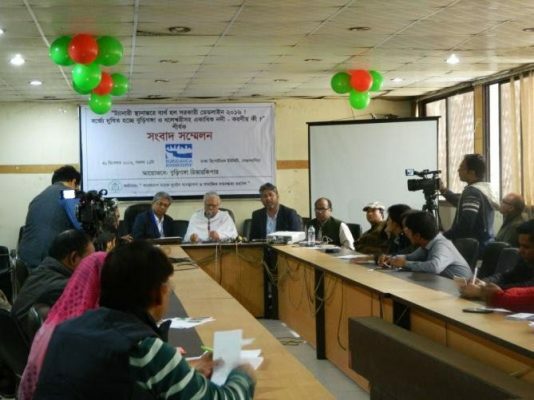 Buriganga Riverkeeper organized a press conference on December 31, 2016, Saturday, 11:00 am at the Dhaka Reporters Unity on Government Failed to Meet the deadline 2016: ‘No Sign of Tannery Relocation this Year’. To brief journalists about the latest status of the shifting of tanneries to Savar as 31st December 2016 was the last date for the relocation of tanneries from the capital’s Hazaribagh area. 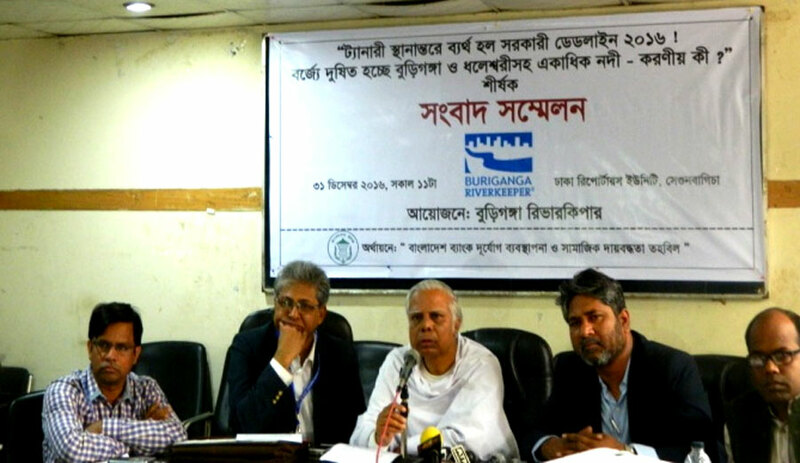 Chaired by Sayed Abul Maksud, the eminent columnist and Vice-President of BAPA, the keynote speaker at the press conference was Sharif Jamil, Buriganga Riverkeeper and Joint Secretary of BAPA. The press conference was also attended by MS Siddiqui, the member of the BAPA’s National Assembly, Alamgir Kabir, coordinator of the Green Voice, Sheikh Rokon, Secretary General of Riverine People, Abdul Karim Kim, Surma River Waterkeeper , and others. It is known that – with the deadline of December 31, 2016, the government assured to relocate the tannery from Hazaribagh to Savar. At this point, the Industries Minister Amir Hossain Amu ordered the owners to relocate their tanneries otherwise; an ultimatum would be given on the closure of tanneries. He also threatened that all sorts of utility services including gas and electricity supplies will be cut off from their establishments. Ironically, only 34 tanneries have been transferred by far, in fact, not even completely. The remaining tanneries still left in its place. In light of these points, Sharif Jamil, Buriganga Riverkeeper and Joint Secretary of BAPA said – the 60% pollution to the rivers around Dhaka occurs from the industries. There are approximately 220 tanneries right now actively working at Hazaribagh. Merely Tanneries are responsible for around 30% pollution to the river Buriganga. On the other hand, 30% of the total pollution to the river is done by the government institutions including WASA and the City Corporation. 10 % of pollution comes from the households. 42 dyeing factories waste at Shyampur are directly mixing with the Buriganga water. Altogether 2 crore 16 lakh liters waste is going to the Buriganga every day. In fact, several units of the tannery industrial estate, including the solid waste management plant, chrome recovery plant and salt purification plant, were yet to be built in Savar. As a result, the Dhaleswari river near the estate was being polluted by the wastes from the tanneries already, he alleged. from the capital’s Hazaribagh within the December 31 deadline. According to the government, the tanneries were supposed to be relocated by now. In this situation, what initiatives the Government has taken to follow up after the announcement they have made is of a question. Sayed Abul Maksud stated that there has been sufficient news on the tannery, on behalf of different organizations steps were taken for ensuring the relocation of tannery and proper waste treatment, but all the efforts went in vain. He also added Government is to look after if their announcement is being followed and work has been done. We want to save the rivers and environment. According to the announcement it is not possible to relocate the tanneries overnight. The government has befallen according to the announcement. The deadline has crossed and the tanneries are still not relocated. Government should clearly state the next step to the public. Government and industry owners are equally responsible for the Buriganga pollution and environmental pollution. Hence both stand accountable for the current scenario and they need to rectify the situation. While answering one of the journalist’s questions he said that we can carry on with our press conferences, create pressure, round table discussions and participate in movements for ensuring the relocation of the tanneries. But rest of the work is to be done by the government and the owners. We want to save the river and also the tanneries with the joint effort of the owners and government. We urge that the government to take more fruitful initiatives with proper planning and implementation for bringing an end to the pollution. In response to a question from the journalist Sharif Jamil, said that both government and tannery owners are accountable for the current situation. The tannery owners did not show their infrastructural design or submit a work plan on time. On the other hand the government did not provide sufficient facilities for relocation of the tanneries after making the announcement. The demand from the press conference was to public the relocation plan of the government in details and immediately stopping of all the pollutions to the rivers.